RALEIGH, N.C. — Henrik Lundqvist is at his best against the Carolina Hurricanes. The veteran goalie was at it again as he stopped 43 shots to help the New York Rangers beat the Hurricanes 2-1 on Tuesday night. It was Lundqvist's 21st win in his last 25 starts against Carolina. "Some teams, the matchup just works for you for some reason," Lundqvist said. "I have some teams where it works the other way. It's hard to explain sometimes. I think the big thing is to not overthink it, good or bad." Vladislav Namestnikov got the tiebreaking goal early in the third period, and fourth-line forward Connor Brickley also scored for the Rangers, who split a four-game trip. The Hurricanes, who are 16-6-1 since Dec. 31, got a second-period goal from Jordan Martinook and peppered Lundqvist with 18 shots in the third period but couldn't get anything past him. He had a spectacular pad save on Carolina captain Justin Williams with 1:37 left from point-blank range. "We survived and he was a big piece of it," Rangers coach David Quinn said of Lundqvist. "Boy, he had a real good night." Curtis McElhinney finished with 24 saves for the Hurricanes, who had won six of their last seven games. They outshot the Rangers 44-26 and were in control much of the game. "It was the best game we've played, probably of the last seven or eight," Hurricanes coach Rod Brind'Amour said. "it just didn't work out." The Hurricanes weren't exactly thrilled with the quality of their scoring chances on Lundqvist. "He played well but I don't know if we did enough to get anything by him," Martinook said. After a scoreless first period, Martinook gave Carolina a 1-0 lead at 9:53 in the second. He was able to gather a rebound of Dougie Hamilton's shot and beat Lundqvist. Just 47 seconds later, the Rangers tied the game on Brickley's first goal of the season. Filip Chytil flipped a backhand shot at McElhinney and the puck bounced off the goalie's right shoulder. Brickley was charging the net and it caromed off of his upper body and in. The goal was originally ruled no good on the ice but overturned on video replay. 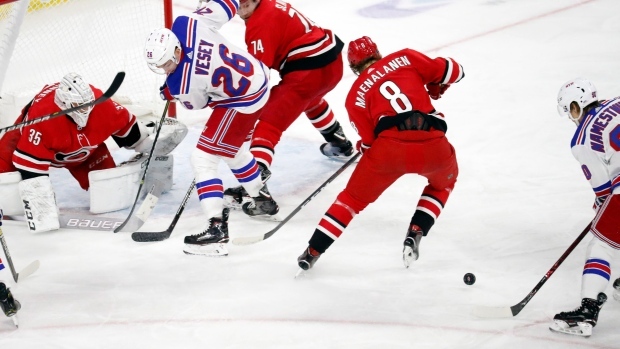 The Hurricanes had killed off a two-man advantage by the Rangers but Namestikov scored just 2 seconds after the second penalty expired at 6:10 in the third period. McElhinney stopped the first shot by defenceman Tony DeAngelo and the rebound effort by right wing Pavel Buchnevich but couldn't deny Namestikov. The Hurricanes have been the talk of the NHL this week for the attention, and criticism, they've drawn for their postgame celebrations. But Lundqvist made sure there wasn't any reason to celebrate with another win over the Hurricanes. "It was a fun game to win, the way we battled," Lundqvist said. NOTES: The Hurricanes ended a 16-game losing streak at New York on Feb. 8. It was their first win on the Rangers' home ice since Oct. 2010. It didn't take the Rangers long to return the favour. ... Carolina C Jordan Staal returned to practice this week but sat out his 26th straight game with a concussion. Staal has 11 points in 29 games and hasn't played since Dec. 22. ... New York D Brady Skjel returned to the lineup after missing one game with a lower-body injury. Rangers: Host Minnesota on Thursday night. Hurricanes: At Florida on Thursday night.